- follow/ unfollow features as requested by popular demand. 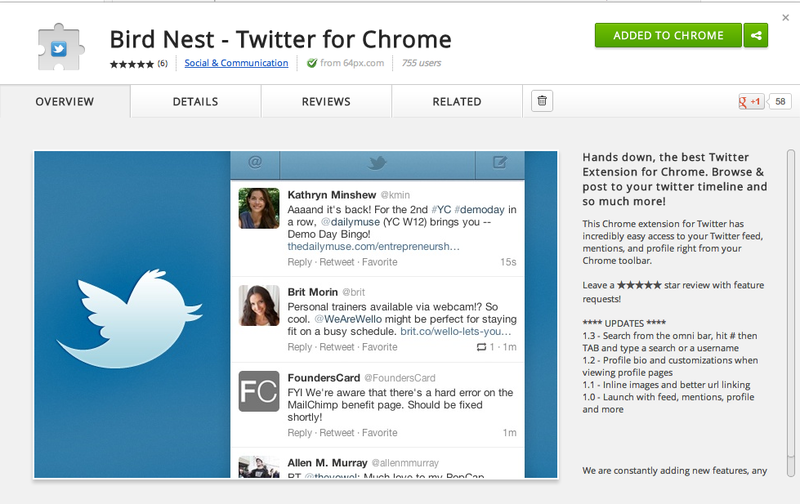 - Has been renamed from Bird Nest - Twitter for Chrome to "Twitter for Chrome, Bird Nest"
If you've been reading ForTechiesOnly.com religiously (and you should be ;) ) you will have noticed that ForTechies tends to get the early scoop on some of the hit apps in the chrome store. Specifically , ForTechies has been covering the releases of 64px.com chrome apps. Including facebook for chrome, pinterest for chrome, and instagram for chrome. ForTechiesOnly breaks the story on hot chrome apps and other tech media figures it out monthsl later, for example check out this AOL video on Instagram for Chrome. A simple and frictionless experience to quickly check your twitter feed or post a message. Just like facebook for chrome and instagram for chrome provide an awesome quick access experience to users, twitter for chrome brings the same high quality experience to twitter users. P.S. Renaming the app to "Twitter Twitter Twitter for chrome" would give it better SEO position in the chrome store.... IMHO.